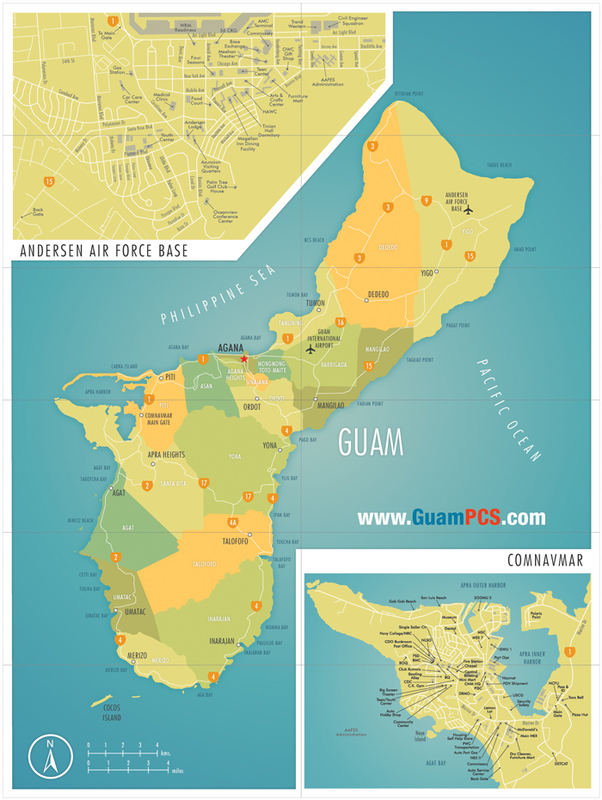 As you may have already experienced, many of the websites you come across about the Island of Guam are out of date and offer little useful information to help you plan your move and answer your questions. At GuamPCS.com, we understand the value of maintaining an internet based source of accurate and comprehensive information that's available to our customers 24 hours a day. We strive to ensure the information we provide is accurate and current. Should you find a “dead link” or incorrect phone number, please let us know right away so we can correct the problem. If there's something you'd like to see that isn't here, send us an email and we'll include it in our next update. Guam's newest (and currently only) USO opened it's doors in 2006. Located within the Royal Orchid Hotel, the USO provides service members and their families' free use of computers and internet access. The Royal Orchid is located at 636 Pale San Vitores Road in Tumon. Please call 671-647-4USO or write mgr.gu(uso)uso-pacific.org?subject=Contact - USO. In 1998 the U.S. Department of Defense opened schools for children of American military personnel with an attendance of 2,500 students in 2000. Children of active-duty military members, and federal employees hired from the U.S. can be enrolled in either DoD Domestic Dependent Elementary and Secondary Schools (DDESS), Guam public schools, private schools or even choose to be home schooled. If children are enrolled in schools other than DDESS Guam Schools, then parents will be responsible for paying attendance costs. The Guam Public School System is responsible for grades Kindergarten -12 and has over 31,000 students attending its 25 elementary schools, 7 middle schools, 4 high schools and an alternative school. 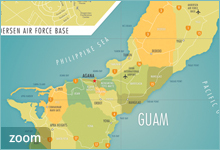 There are approximately 25 Private schools in Guam of which most are affiliated with religious denominations. New admissions are limited in most of the private schools so parents should register as early as possible. Important school records: report cards, test results, Individual Education Plans, if applicable, and any other documents that would help in student placement. An official immunization card or a statement on official medical letterhead signed by duly authorized medical personnel, or school health records, any of which shows the dates on which the child has received his immunizations. Note: TB skin test results need to be conducted within a year before registration, unless the student has entered from a place other than the U.S. or its territories, in which case the TB skin test results need to have been conducted within six months before registration. If the results are positive, the child must obtain a TB evaluation clearance form from the Department of Public Health in Mangilao before registration can be completed. Requirements also include results of physical exams conducted within one year before or after entry into any school system or a physical exam appointment card. The overseas screening form does not show actual physical exam results and officials do not normally accept it as proof of a physical exam. Bus transportation is available to all eligible students attending DDESS Guam schools living within the commuting zone. Once enrolled at the school, parents need to complete a bus transportation form to be signed by the school registrar. A bus pass can then be obtained from the Student Transportation Office (STO), which is located at the District Superintendent's office (DSO). Note: Parents should check with the STO for specific bus route information before agreeing any off-base house lease to ensure the location is within the commuting zone. Due to inclement weather students should carry a raincoat, hat & rubber shoes as rain showers are frequent. Public school bus schedules are available from the school or parents can call the bus operations section at the Guam Department of Public Works at (671) 646-3166/3208/3122. The DDESS Guam school district provides students with special needs with a special education program. Physical therapy and occupational therapy services, speech and language services, are available for students in preschool through grade 12. In Guam public schools, students with disabilities attend class with non-disabled students. The Guam Special Education Division programs serve eligible students with a range of academic, emotional, behavioural and physical needs. Programs are also available for academically and creatively gifted and talented students. Special classes are available if the severity of the disability precludes achieving satisfactory services in the regular classroom, with supplemental support. P.O. Box DE, Hagatna Guam 96932. Meetings are held on the third Thursday of every month at Tamuning Christian Fellowship from 2-4pm. We will not have meetings during the months of June and July. A membership application must be filled out if persons desire to be a part of the GHSA yahoogroup email list where one would get notices of GHSA functions, events, field trips, extra curricular activites and more. "Children not attending a private full-time school and who are being instructed in study and recitation for at least (3) hours a day for one hundred seventy (170) days each calendar year by a private tutor or other person, in the several branches of study required to be taught in the public schools of this Territory and in the English language, shall be exempted from attending the public school." This means that home schooled need to be child be taught in the same subject areas as taught in the public schools. IMPORTANT NOTE: It is current Guam Public School System (GPSS) policy that no credit for any high school courses completed at home will be granted any credit by the GPSS. Homeschoolers are also not entitled to any benefits or services, including sports teams, provided by DOE. Guam Community College is a vocatoinal technical school offering over 50 'job related' courses of study in professional and technical degree programs. It offers a variety of community service and specia programs to prepare students for college experiences including English-as-a-Second Language, Adult Basic Education, General Education Development (GED) preparation and testing, an Adult High School Diploma program, External Diploma Program and Apprenticeship. Accredited by the Western Association of Schools and Colleges the University of Guam offers 35 degree programs at the undergraduate level and 13 master's level programs within five colleges: the College of Arts and Sciences, the College of Education, the College of Agriculture and Life Sciences, College of Business and Public Administration and the College of Nursing and Health Science. Pacific Islands Bible College is a small-accredited four-year college with sites on Guam, Chuuk, Palau, and Yap, offering various programmes of study in biblical studies. Guam has strict quarantine requirements in place to keep the island rabies free. There are two authorized animal quarantine facilities on island. The length of time your pet will be required to be quarantined will depend on how many of the requirements you can fulfill prior to arriving. Please contact the facilities directly for details on the procedure. Since requirements change from time to time, they're the best source. 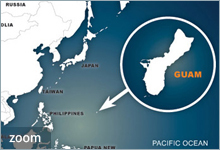 Guam has its own Customs Laws that control what comes into the territory. They may be of concern to those of you who plan to bring your personal firearms with you rather than packed in your household goods. With a little preparation, it's a breeze. When you arrive on the island you'll be provided with a special form to complete prior to deplaning. On this form you MUST declare your firearms. You must describe the firearm on the form as well as declare it's value. Don't worry, you're not going to be charged, it's merely information used by Guam Customs. After you deplane, you'll proceed through U.S. Immigration and down the escalator to Guam Customs. Here, you'll pick up your checked baggage before proceeding to the Customs Official. It's here you'll need your completed Guam Customs Entry Form. The Customs Official will inspect your firearms to ensure they are legal to possess. Once that's taken care of, they will provide you with some documents you'll need to complete and take to the Guam Police Department to register your firearms. This must be completed within 30 days of your arrival or you may be subject to criminal penalties. We also recommend as an additional measure that you contact the Transportation Security Administration well in advance to ensure you're in compliance with current regulations pertaining to the transport of firearms on commercial aircraft. A little prevention can save you a ton of cure when trying to get checked in for your flight. Finally, well in advance of departing with your firearms, review the Guam Police Department's webpage to ensure you have all the proper documents to register a firearm on Guam. Various forms pertaining to firearm ownership are also available on line at www.govguamdocs.com. Important Note: Any vehicle shipped to Guam which was purchased within 90 days of it's arrival is subject to a 4% tax. Although this has been the law for some time, it has not been enforced until early 2006. Many families in the U.S. have more than one vehicle. It's no different here. For those transferring with the military and are only allowed to bring one vehicle, it's easy enough to pick up a "Guam Bomb" as a second set of wheels. With the number of transferring military personnel, the papers are full of used cars for sale. Most people are pretty anxious to see their car for the first time after a 4-6 week boat ride to the island. A few things to think about prior to shipping your vehicle: It's a good idea to do a quick inspection to make sure there's sufficient tread on your tires, all the lights work, and there are no cracks in the windshield. A vehicle safety inspection is required by Guam law and should something not be in good working order, you'll have to make repairs before you'll be allowed to register your car. Taking care of it state-side saves a lot of time and trouble. You should also make sure you keep the original registration and / or title and proof of insurance. Just leave a copies in the vehicle. You'll need the originals to ensure a hassle free registration process. Call the Navy POV Pickup Station at 671-339-2205. They can tell you if your vehicle has arrived or not. The facility is located in Bldg #3179 off Sumay Road on "Big Navy." You'll need to go to the Department of Motor Vehicles for a temporary permit to operate your vehicle. Be aware this permit expires 5 days from the date of issue. Make sure to bring your driver's license, military ID, proof of registration and original vehicle registration, and your shipping documents. To pick up your car from the Navy POV Pick Up Station. You'll need all the documents listed above. The next step is to obtain a vehicle safety inspection, which is required by Guam law for vehicle registration. Inspections can be completed at the "Big Navy" Autoport located in Bldg #257 next to the Navy Exchange. Call 671-339-5455 for more information. Finally you'll go back to DMV to finish the process and obtain your Guam license plates.